The number of countries with religion-related terrorist violence has doubled over the past six years. In 2012, religion-related terrorist violence took place in one-in-five countries (20%), up from 9% in 2007. In March 2012, for instance, a rabbi and three children were killed by an Islamist extremist at a Jewish school in Toulouse, France. Women were harassed because of religious dress in nearly a third of countries in 2012 (32%), up from a quarter in 2011 (25%) and less than one-in-ten (7%) in 2007. In Moldova, for instance, two men attacked a Muslim woman in the capital city of Chisinau, calling her a “terrorist” and tearing her headscarf. In 2012, 54 of the 198 countries in the study (27%) had governments that regulate the wearing of religious symbols or attire. This is almost unchanged from the previous year (53 countries, 27%) and significantly higher than in 2007 (21 countries, 11%). While there may not be a direct causal connection between government regulations and social hostilities involving religious attire, our data show that harassment of women over religious dress occurs more often in countries where the wearing of religious symbols or attire is regulated by any level of government. For the first time in the study, China experienced a high level of social hostilities involving religion, with multiple types reported during 2012, including religion-related terrorism, harassment of women for religious dress and mob violence. In November 2012, for instance, a Han Chinese man accosted a Uighur Muslim girl in Henan province and lifted her veil. In response, violent protests broke out as hundreds of Uighurs demonstrated against the incident. The Middle East and North Africa was the most common region for sectarian violence; half of all countries in the region in 2012 experienced this type of violence. Globally, sectarian violence took place in nearly one-in-five of the world’s countries in 2012 (18%), up from 8% in 2007. In China, for example, tensions escalated into violence in October 2012 when Tibetan Buddhist monks led an attack against Hui Muslims at a Gansu province site where a new mosque was being built. In Syria, the ongoing civil war has fallen partly along sectarian lines, leaving tens of thousands dead and displacing millions in recent years. And in Iraq, sectarian strife between Sunni and Shia Muslims continued, and attacks of some kind continued to occur on an almost daily basis. Roughly three-quarters of the global population lives where overall levels of religious restrictions or hostilities were high or very high in 2012. Among the world’s 25 most populous countries, Egypt, Indonesia, Russia, Pakistan and Burma (Myanmar) stand out as having had the highest levels of overall restrictions in 2012 when both government restrictions and social hostilities involving religion are taken into account. Brazil, the Philippines, Japan, South Africa and the Democratic Republic of the Congo had the lowest levels of restrictions and hostilities. The number of countries with a very high level of religious hostilities increased from 14 in 2011 to 20 in 2012. Six countries – Syria, Lebanon, Sri Lanka, Bangladesh, Thailand and Burma (Myanmar) – had very high levels of religious hostilities in 2012 but not in 2011. 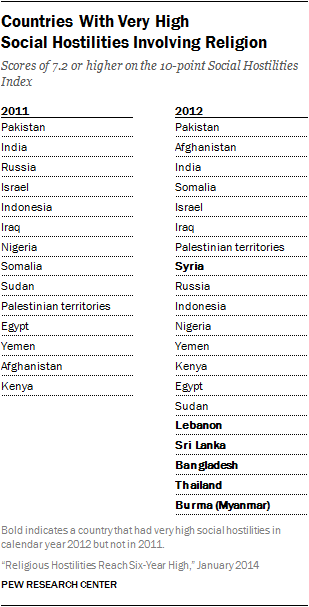 The number of countries with very high government restrictions on religion rose from 20 in 2011 to 24 in 2012. Five countries had very high government restrictions in 2012 but not in 2011: Azerbaijan, Tajikistan, Morocco, Iraq and Kazakhstan. Read more about how the Pew Research Center study measures social hostilities involving religion and government restrictions on religion.